Floors from HomerWood's new 100% Reclaimed American Oak flooring collection. 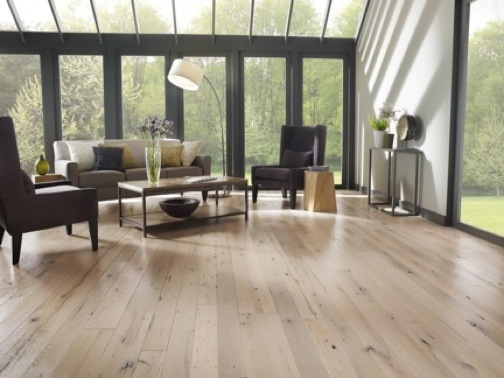 One of the most appealing products I’ve found in doing my flooring research is a new 100% Reclaimed American Oak floor from HomerWood Premium Hardwood Flooring. Not only is it a sustainable choice—it’s made of slow-growth timber, which came from forests in the Appalachian Mountain region and was used to construct barns across areas of Ohio, Virginia and Pennsylvania in the early 1800s—it’s also beautiful and filled with character, including nail holes, cracks, mineral streaks and saw kerfs. The flooring is also offered with a natural oil finish in brown, whitewash, natural and slate-colored options. This kind of finish gives the wood a smooth, subtle patina with an extremely low-luster that brings out the graining and texture of the wood. The flooring is available in smooth or hand-scraped styles and comes in both solid and engineered versions. HomeWood’s Titusville, Pennsylvania manufacturing plant has also received Chain of Custody certification from the Forest Stewardship Council, which is the most widely recognized third-party certification organization for sustainable wood products in the country. If we do replace our floors, this is certainly an eco-friendly option worth considering—I especially like the finish. The price ranges from $14-$25 per square foot, depending on the width chosen, installation costs vary by region. For more information on these floors, call HomerWood Premium Hardwood Flooring at 814-827-3855, visit its Web site, or visit its Facebook page. I love the look of these floors.. I wish I could replace my entire house with it!! The color of the floor is so unique. It’s just right-not too light, not too dark.